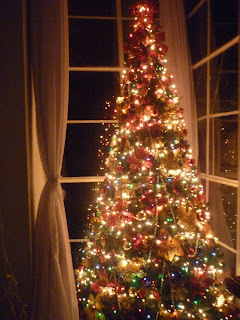 Christmas Tree has been an icon for Christmas Season all over the continents especially here in the Christian country of Asia, The Philippines. 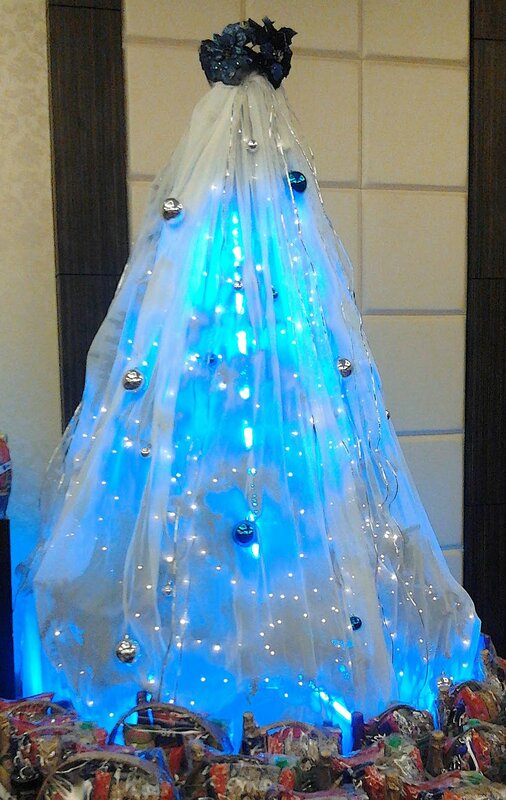 Traditionally, Christmas Tree is a real evergreen coniferous tree designed with Christmas lights which were originally candles, ornaments, small toys, candies or any attractive materials great for decoration. To complete the decor is an angel or a star placed at the top of the tree in which they represent the host of Angels or the Star of Bethlehem from the Nativity. Here in the colorful island of Cebu, you can see different designs of Christmas Trees in different sizes. 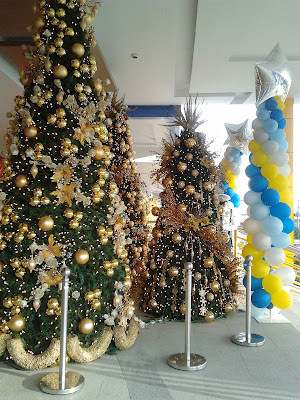 In this special article, the FaceCebu.net author will roam all over the city just to take a glimpse and shot of the different beauties of Christmas Trees in different buildings, establishments, malls or even in your very own home. ABOVE: A 3 year old Christmas Tree designed with recycled CD's furnished with used red clothes and some laces. 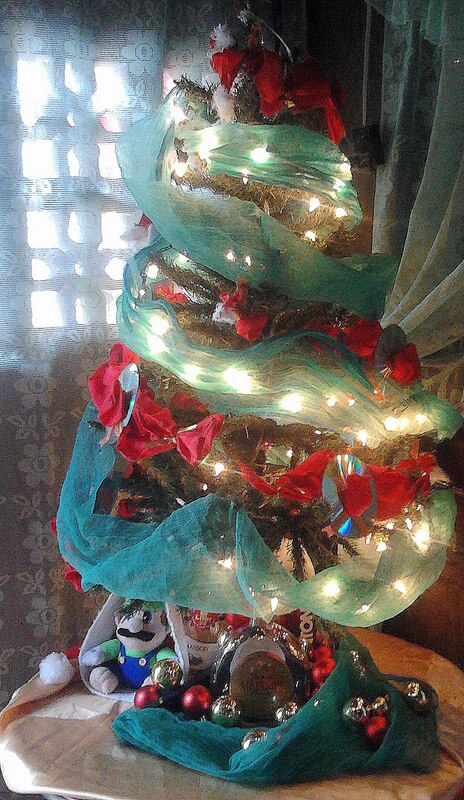 Dressing up the tree is an old unused green mosquito net hang with an elegant touch. 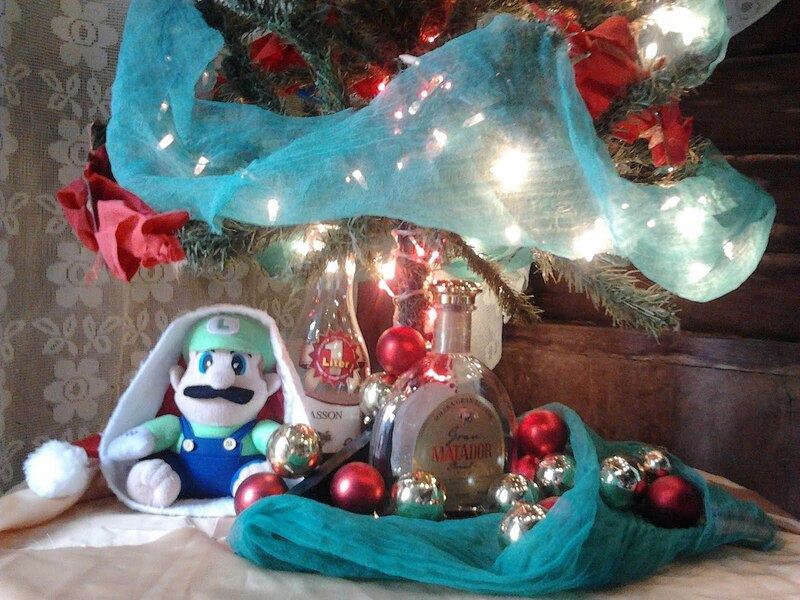 BELOW: Under the humble Christmas Tree are three empty wine bottles touches with some Christmas Balls lying under a used green mosquito net and beside in them is a cute Luigi inside Santa Hat. A wedding inspired Christmas Tree covered with white net all over it, touched with blue and gold Christmas Balls staged during the Globe Christmas Party for Media and Bloggers in Harolds Hotel. Three Christmas Tree siblings welcome every shoppers who will visit the newly built Jcentre or commonly known as JMall at AS Fortuna, Mandaue City. A golden theme is basically observed in this design. 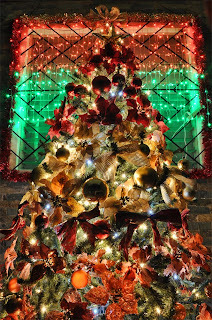 Michelle Varron's Christmas Tree decorated with candy-colored balls and it's on a 2nd floor window so visible from the street. 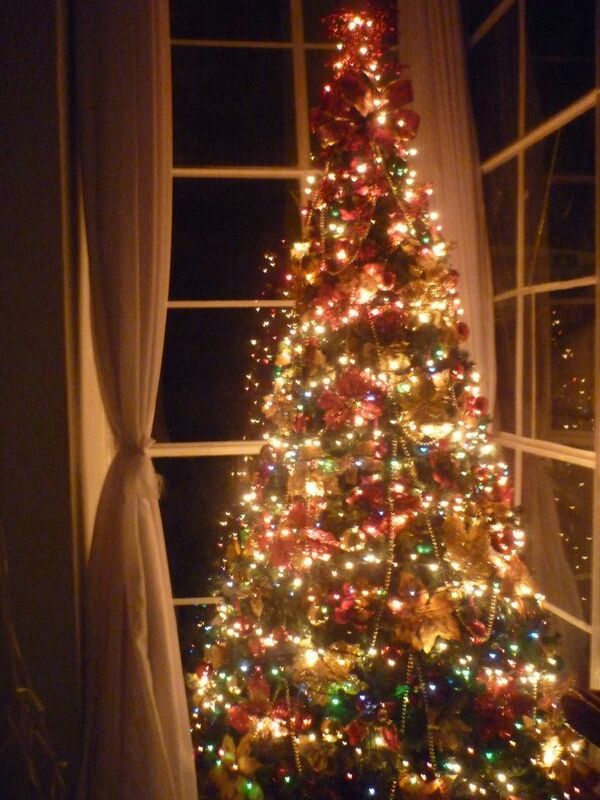 This Christmas Tree is tagged as a tree by a modern window. Note, this post will be updated once new photo of Christmas Tree is spotlighted. 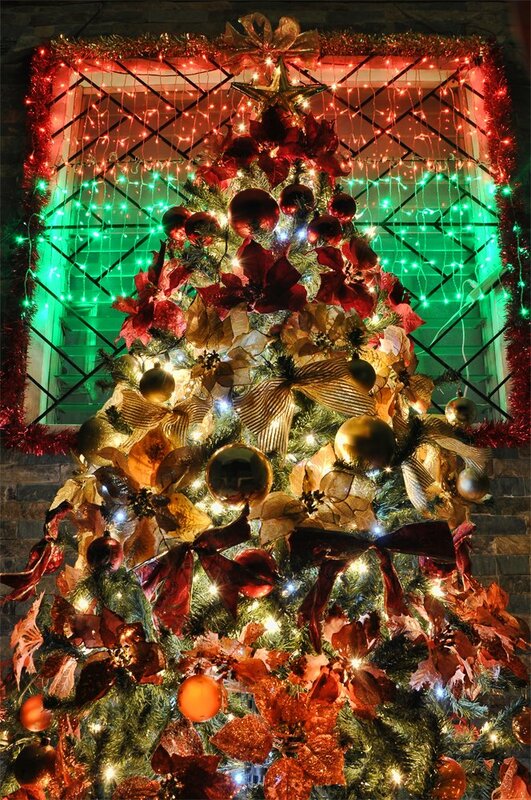 But if you are kind enough to send a photo of your unique Christmas tree, then please send it to facecebu(at)gmail(dot)com and we will feature it in this post with your name in it. 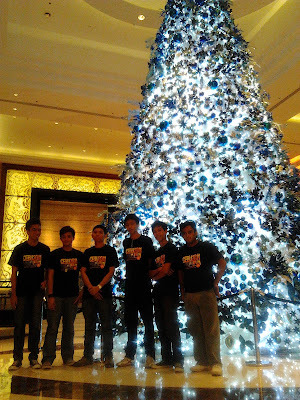 I was there... right beside that giant ice christmas tree at Radisson.. I really don't know, last thing I remembered was a flash of light while I was standing beside the tree. ok --- i know, it seems i just have to admit it was you..